Real Madrid once again showed superiority over Atletico Madrid at the Wanda Metropolitano on Saturday as the Los Blancos defeated their neighbor 3-1. Real Madrid won its fifth league game in a row as it displaced Atletico Madrid from the second position. Madrid is now five points behind Barca, a win for Barca could restore that gap to eight when they face Athletic Bilbao on Sunday. 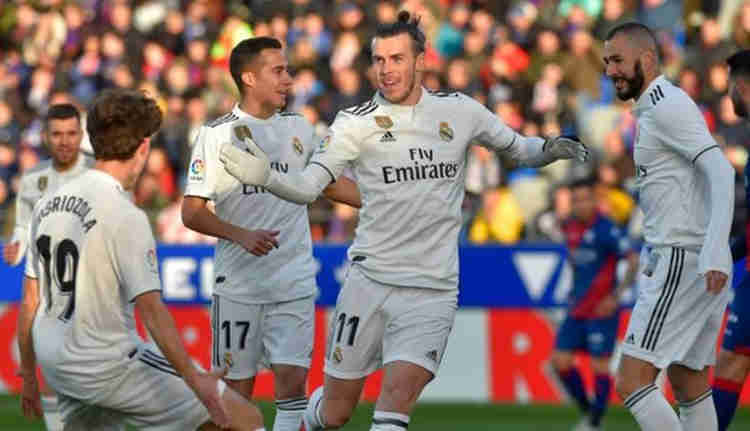 It was a scintillating affair as Thibaut Courtois overcame the jeers and Gareth Bale delivered a timely reminder of his talents as Real Madrid beat Atletico Madrid 3-1 in a feisty city derby. Madrid could be in the thick of a title race if the Barcelona lost to Athletico Bilbao. Bale had been left out of the starting line-up for the second time in four days after he was also a substitute against Barca in the Copa del Rey on Wednesday. The Welshman’s goal, his 100th for Real Madrid, will not have been lost on coach Santiago Solari and ended Atletico’s hopes of a comeback after Sergio Ramos’ penalty put Real in front at half-time, with Antoine Griezmann earlier canceling out Casemiro’s acrobatic opener. He was whistled when he came out alone to warm-up when he emerged again with his team-mates and then before kick-off too, as the Atletico ultras behind the goal hurled dozens of toy rats towards his head. A sign read, ‘Thibaut – Rata’, just to underline the point. Alvaro Morata had gone the opposite way, also via Chelsea, now for Atleti after starting out at Real Madrid. He was cheered and, despite a quiet game, would have scored but for VAR ruling out an impressive job in the second half. First, though, Griezmann equalized sent through by Angel Correa, who was fortunate not to be penalized for a robust challenge on Vinicius. Griezmann, just onside, poked the ball through Courtois’ legs. Bale came on for Vinicius but Atletico was on top and again, felt aggrieved after Morata fell over a clumsy Casemiro challenge in the box. Referee Estrada Fernandez gave Real a free-kick.